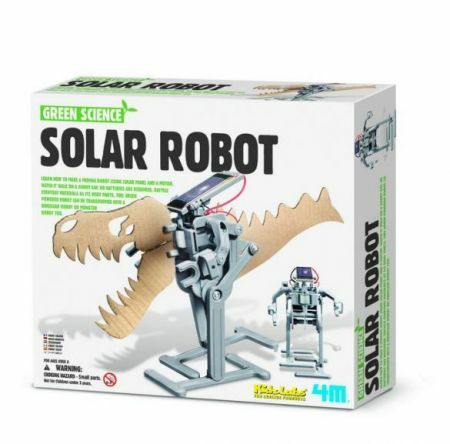 Learn how to make a moving robot using solar panel and a motor. Watch it walk on a sunny day. No batteries are required. 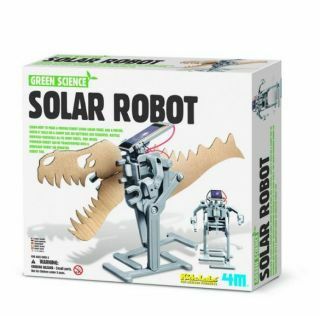 Recycle everyday materials as its body parts, this green powered robot can be transformed into a dinosaur robot or monster robot too. Robot body size: 14cm in height. Contents: 1 solar panel with wires, 1 solar panel holder plate, 1 support arm, 1 gear case body with motor and cams installed, 2 arms (right and left), 2 leg links, 2 legs (right and left), 2 feet, 2 terminal caps, 2 body template support clips, washer screws, screws, 1 double-sided adhesive foam and 1 detailed instrutions. (Also required, but not included: small crosshead screwdriver, 1 empty paper cup and 2 forks). For Ages 8+ and adult guidance recommended.